Summer holidays were short this year, for various reasons, the highlight being five days in Portugal, my first time in that other Iberian nation. We started with two days in Lisbon where the nights were already pressing with cold, unlike in Barcelona where the languid and steady heat had kept the nights alive and optimistic. My lasting impression of the city is one of sadness and worry. The façade of the city was one of ruin: run down and abandoned buildings, chipped and faded decoration, broken streets and a grittiness everywhere. 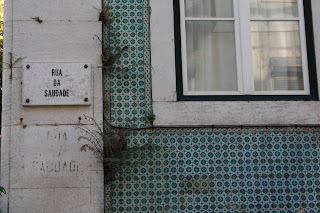 Such features are often charming and lure you onward with a sense of mystery or their promises of history, but in Lisbon, and later in the rest of Portugal, the sense of decay was riddled with a foreboding and negativity. 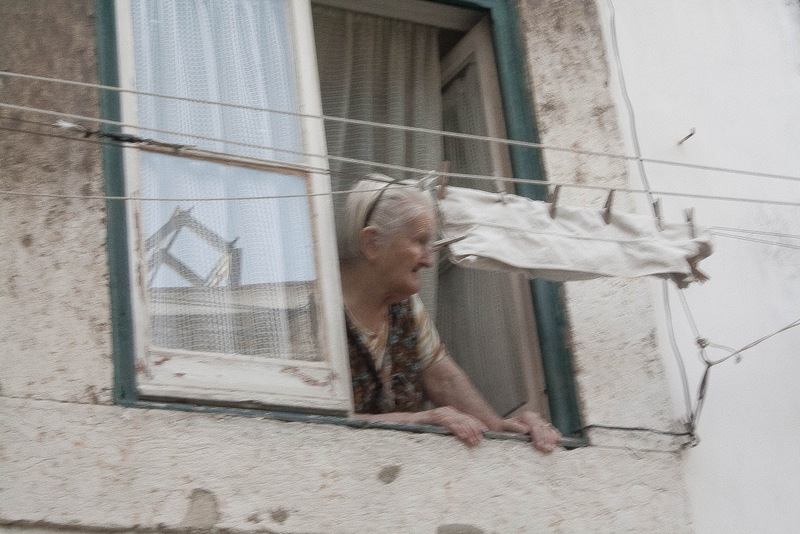 The buildings were largely empty with whole blocks for sale and those that were occupied were often inhabited by the elderly. On so many tangled streets and in so many little squares I saw lonely women leaning against their window staring outwards as if looking for the return to port of an ancient galleon long since lost at sea. The Alfama district nestled between the Tagus River, the longest in the peninsula, and the base of the castle perfectly encapsulates this feeling. 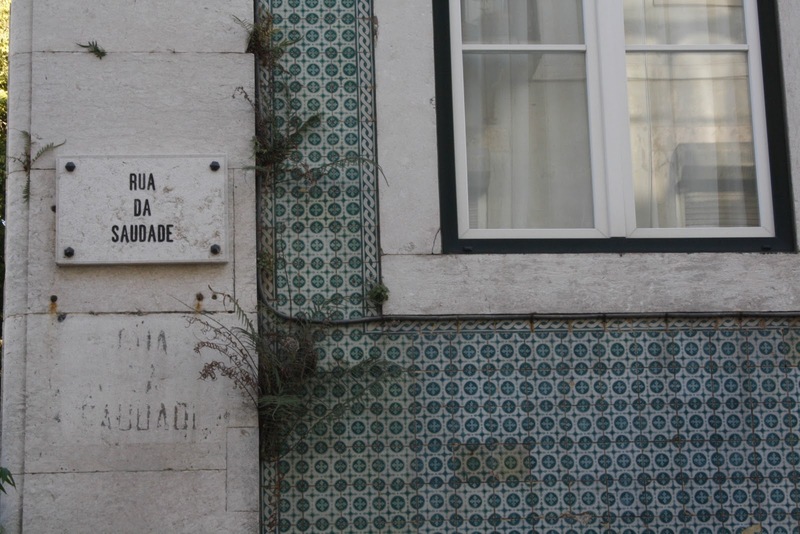 The winding streets are full of Moorish charm, like the back streets of Granada, but instead of Gypsy music, the streets and squares fill with the wail of Portuguese Fado. 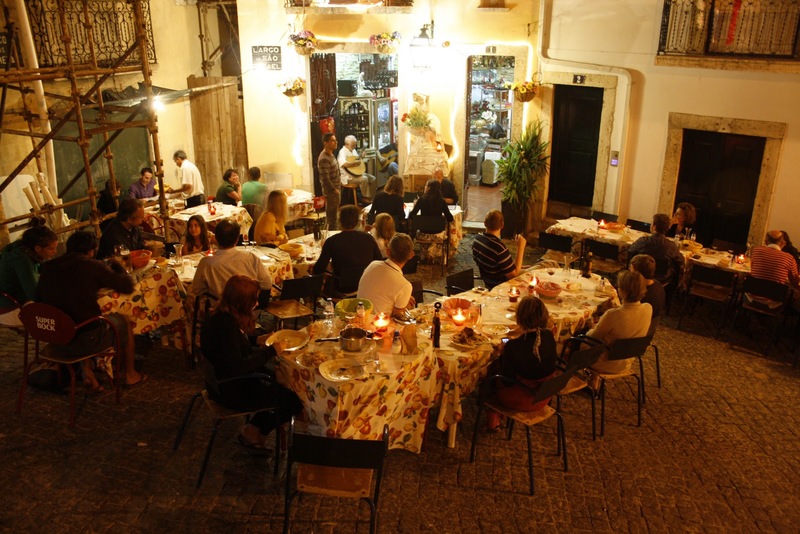 While much is clearly aimed straight at the tourist who come here for the alfresco dining in the sparsely populated streets and squares, there is clearly an authentic link to the roots of the music. In Granada, the gypsy caves and restaurants often have a polished and practised air to them, whereas in the Alfama there seemed less emphasis on show and more on keeping it low key. Not everywhere of course, but it was a sublime pleasure to lose your way in the bazaar-like streets by following a luminous trail of melancholy voices, with the landscape of ruin and abandon forever augmenting the power of the music all the way. I guess this is the beginning of what the Portuguese call "saudade"? I read Fernando Pessoa’s “The Book of Disquietude” a few years ago and the same pessimistic melancholy permeates the pages there too. I made a quick stop to a weird local record store, where the patron was an ageing man of 50 or so who remained in deep conversation with his similarly aged friends as I entered, not even acknowledging me. He had a fine collection of jazz, indie and the more eclectic side of commercial rock. He looked away nervously when I asked him the price of a rare Spectrum clear vinyl 12” hanging amongst his first addition Spacemen 3 singles on the wall, but I did pick up Spiritualized “Amazing Grace” ep with its alternate versions. The messy, slow free jazz squall of the “Star Spangled Banner” (entitled here “Amazing Grace (Peace on earth)”, perhaps cynically) is also something of a metaphor for Portugal: a country mangled in its own history and delusion of past grandeur. And of course I picked up some Fado. One of the cheaper albums amongst his collection of old vinyl was an album by Amália Rodriguez called “Vou dar de beber à dor” ("I´ll offer pain a drink") from 1969 who’s title track is one of her and Fado’s defining moments. 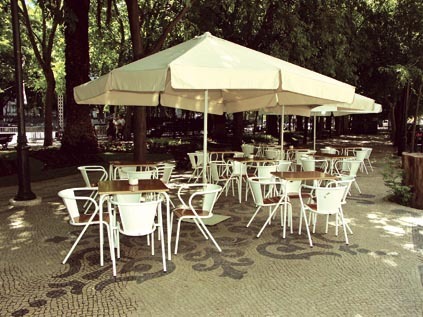 Another interesting place of musical note is the Avenida da Liberdade which is a broad, leafy avenue joining the business district with the historical centre. 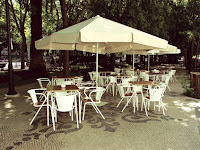 The shops on either side are lined with high end designer stores, but beneath the trees are many quiosque cafés playing jazz by day while at night they are filled with the young and laptop DJs. Second stop of the trip was to the little sea side village of Nazaré, just west of Fátima on the coast. The sea was a far cry from the calm of the Mediterranean, with the big, rushing Atlantic waves causing most of the people to stay on the shore watching in excited fear and going in up to their knees only once the waves had broken. At night there was a little local festival with a stage set up on the stand and plenty of activities spread out along the shore. One of the curiosities of this show was the two Peruvian pipe bands. I say curiosity not for the novelty, but to emphasise one of the most frustrating cultural questions of our time: How and why do Peruvian pipe bands proliferate and disseminate about the world? It is almost like there is a secret agreement between world governments and Andean nations that every major centre must have at least one pipe band performing in the streets. The fact that two of them should turn up in one little village adds an extra dimension to this mystery. But since these pipe bands are literally everywhere and everywhere one has to ask, what is the novelty of them? Yet there are still people enthralled, listening and taking photographs, while others still worse buy the CDs. My father once told me he bought one on a trip to Melbourne, but I could excuse him as he lives in the country and hardly went to the city for years, even Perth, where I am sure they also have one. If not, we will export them from here! Surely this cultural trend has gone too far? 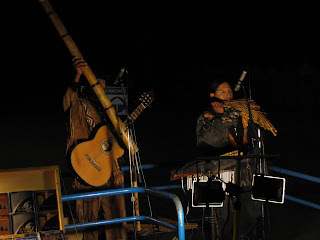 We don’t really want to listen anymore versions of the Titanic movie theme played on a range of Andean pipes to pre-recorded backing music by demoralised Indians dressed up in feathers and skins stomping their feet. A moratorium now! 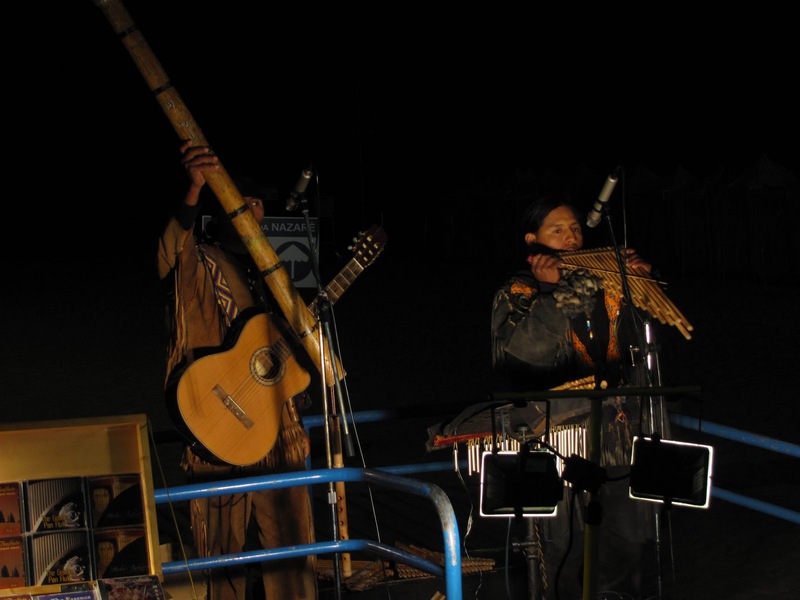 Let us work together to restore dignity to native South American music. Last stop of the trip was Oporto and an afternoon getting quietly smashed on port and the sundry local bodegas overlooking the River Douro. Getting a free (small) glass of 40 year old Taylor’s Tawny was a nice touch – thanks to that nice young lady there – next time I will go for the Scion at a cool €100 a glass. We made the trip of see the Casa Da Música in the cities west, which was an interesting, but still slightly underwhelming experience. 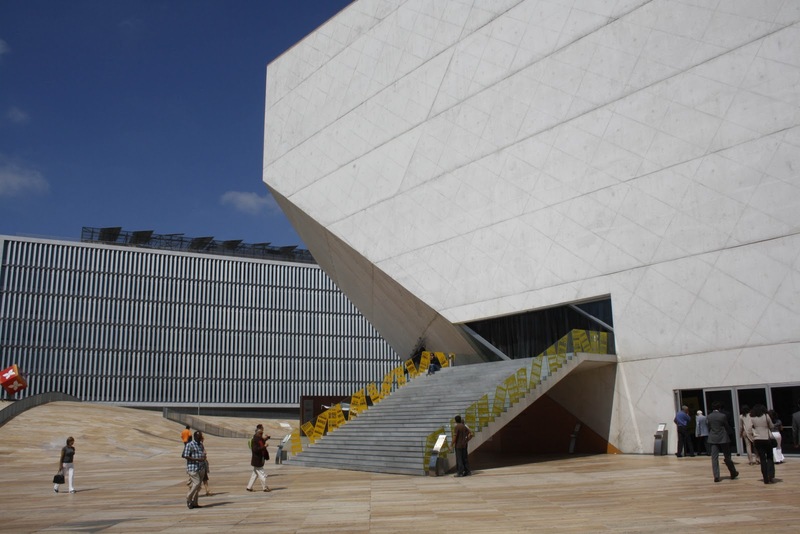 Designed by the much celebrated Dutch architect Rem Koolhaas, the outside was wonderful from certain angles, but quite lifeless from others, though well-lit at night it probably has more charm. From within, the pressing and oblique spaces were inviting, but with little access outside of concert hours, there was no way to fully enjoy it. Apparently the programming is satisfyingly diverse for the locals who are of course wonderfully proud of their monument. Not everyone is as proud of the Fontaínhas district though, where a quiet walk down some of the more beautiful and yet ruinous streets can quickly turn into a brief sojourn into a lawless zone. Some of the tiredest, oldest whores I have ever seen, screeching music from dirty dive bars, haggard looking dealers holding out handfuls of pills and hiding wads of cash while nervous junkies approach and the elderly look on from their windows.